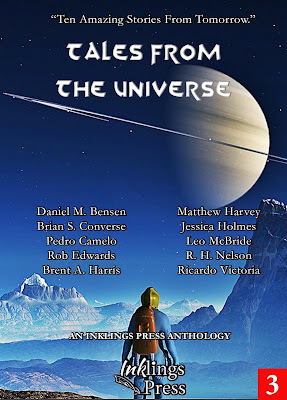 Inklings Press editor Brent A. Harris reveals the cover of the new science fiction anthology Tales From The Universe - designed by Ricardo Victoria - as the countdown to publication begins! Before we launch our science fiction anthology this weekend, I wanted to take a personal moment to share how excited and overwhelmed I’ve been at the prospect of our third anthology. I believe our editor hit the nail on head in our foreword when he talks about the future of Inklings Press. Six months ago, we were nobodies with an idea of creating an outlet for aspiring writers. At first, we had to test the waters for ourselves and get a feel for the self-publishing world. Tales from the Mists and Tales from the Tavern accomplished that. Tales from the Universe now marks the departure for us into a larger world. This launch has a quality to it that I can’t quite describe; I can only tell you that the realness of this release is palpable. 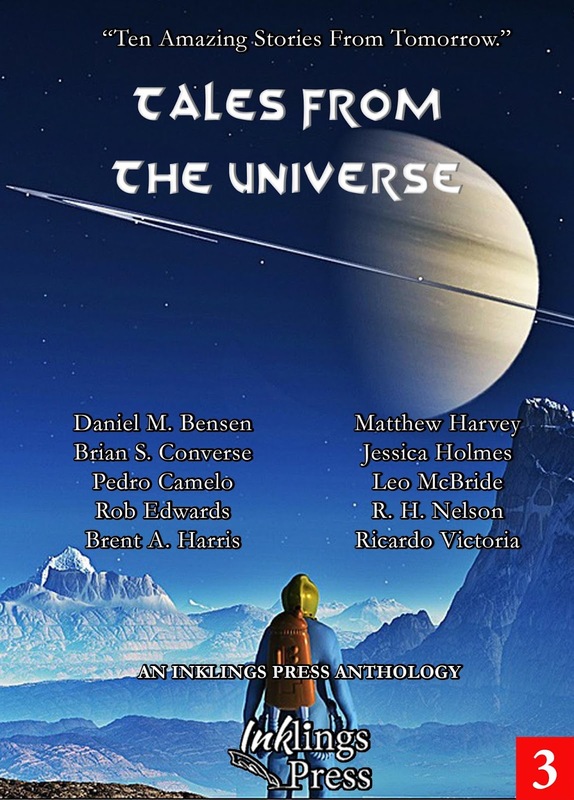 Tales from the Universe has doubled in size and scope. The stories in it are ambitious and there is real talent to be discovered within its pages. This is a book that I know, without doubt, belongs in your book collection. Perhaps I’m being a bit biased, or a little excited, but I believe in this anthology, and the aspiring authors who’ve made this the most satisfying, enjoyable, project I’ve had the pleasure to work with. And I think that joy shows within the pages of the final product. It certainly shows in our cover, designed by Ricardo Victoria. I love the concept of a masked individual staring out across the vast expanse, with the stars and the planets looming close. In the most literal sense, the stars are closer to us than ever before. Humans develop at such an exponential rate, and as we’ve seen with older science fiction movies like, Back to the Future, what we once thought of as our future has now become our past. How quickly time moves. Six months ago, we were that masked person, staring out into the beyond. Now, we are here, proud to introduce you to our latest launch. While we are not where we want to be, (fabulously wealthy, sipping Pina Coladas on a beach in Puerto Rico) as we take stock of how far we’ve come, we can’t help but think what tomorrow will bring. Ricardo, thank you for a lovely cover design. May your future be always full of hope and friendship. Follow the countdown to publication of the anthology on Twitter at @InklingsPress or on Facebook at https://www.facebook.com/InklingsPress. This may embarrass you terrible, dear fellow, but we love you dearly for all that you do! Great cover, sir, has that Amazing Stories inspirational quality to it, love it!